When her beloved small dog died, Bel Mooney was astonished at the depth of her ongoing sorrow. Sharing her loss online and in a newspaper article brought a deluge of responses, spurring Bel to explore these feelings further. Why do humans mourn pets? Can animals themselves grieve – and do they have souls? 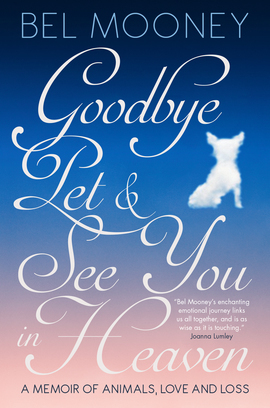 In Goodbye, Pet & See You in Heaven, Bel sets off on an emotional journey to learn more about pet bereavement. She is astounded by inexplicable ‘signs’ of her dog’s spirit, watches Bonnie’s ashes being turned into glass, talks to experts and discusses the mysterious enduring energy of love. She discovers why Ancient Egyptians mummified animals and what different faiths, myths, writers and scientists have to say about animals and the afterlife. She also looks back over her own life and reflects on lessons learned from companion animals – and from wildlife too. As informative as it is deeply moving, Goodbye, Pet is an intensely personal, uplifting look at the love we share with pets, both in life and afterwards. Enriched by heartfelt stories and inspirational words, it is a book to be treasured by anyone who has ever loved an animal.